Artist rendition of the formation of rocky bodies in the solar system. A UK Space Agency-funded instrument, designed to investigate the interior structure and processes of Mars, has been selected to travel to the Red Planet on NASA’s newly announced InSight mission. The UK-funded SEIS-SP is a Seismometer that will listen for “marsquakes” and use this information to map the boundaries between the rock layers inside Earth’s neighbour. This will help determine if the planet has a liquid or solid core, and provide some clues as to why its surface is not divided up into tectonic plates as on Earth. Detailed knowledge of the interior of Mars in comparison to Earth will help scientists understand better how terrestrial planets form and evolve. The SEIS-SP will be provided by space scientists at Imperial College London and the University of Oxford. On Aug. 20, NASA announced the selection of InSight, a new Discovery-class mission that will probe Mars at new depths by looking into the deep interior of Mars. Drilling underneath the red Martian topsoil will be courtesy of InSight’s HP3, or Heat Flow and Physical Properties Package – one of the four instruments the Mars lander will carry. Made by the German Aerospace Center, or DLR, HP3 will get below Mars’ skin by literally pounding it into submission with a 14-inch (35-centimeter), hollowed-out, electromechanically-festooned stake called the Tractor Mole. The German-built mole will descend up to 16 feet (five meters) below the surface, where its temperature sensors will record how much heat is coming from Mars’ interior, which reveals the planet’s thermal history. “Getting well below the surface gets us away from the sun’s influence and allows us to measure heat coming from the interior,” said Smrekar. NASA has selected a new mission, set to launch in 2016, that will take the first look into the deep interior of Mars to see why the Red Planet evolved so differently from Earth as one of our solar system’s rocky planets. 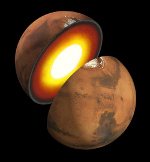 The new mission, named InSight, will place instruments on the Martian surface to investigate whether the core of Mars is solid or liquid like Earth’s and why Mars’ crust is not divided into tectonic plates that drift like Earth’s. Detailed knowledge of the interior of Mars in comparison to Earth will help scientists understand better how terrestrial planets form and evolve.